version 2.3 has been released on 2nd Mar 2018. You may check out the announcement post and read through the changelog to understand what has been updated. 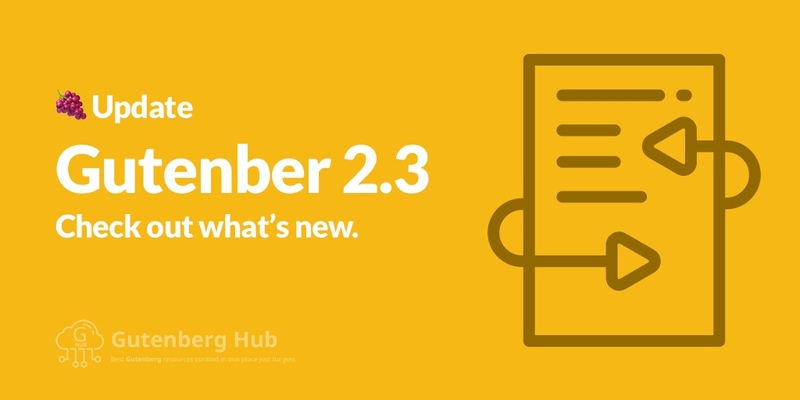 Gutenberg 2.3 release is focused towards extensibility mainly. Notably, it introduces APIs for extending Gutenberg beyond blocks, allowing plugins to register a full sidebar for their functionality. There are also expansions to the template support (now allows to declare nested structures), ability to duplicate blocks, various design adjustments, etc. Overall the tone has been fine-tuning existing elements and simplifying implementations. Let&;s go through some of the main highlights from this update. Continue editing flow iterations by adding a line between blocks to insert new content — it also works within nested groups. Add support for nested templates. This update added support for nested templates. For example, a CPT could use a columns block in its templates and assign a template for this nested block. This uses the third argument of the array defining a block in a template as a way to define a sub-template. Allow duplicating a block through a menu button. HTML block, now with syntax highlighting. Add CodeMirror core library to the HTML block for syntax highlighting.
? New API – Takeover Sidebar ? Introduce new API for allowing plugins to register sidebars. It allows plugins to further extend Gutenberg natively with non-content functionality. ﻿Note: the public facing functions are marked as experimental as they are being iterated in the context of the major extensibility work going on outside of blocks. Add a script that creates a PHP file based on a POT to make the plugin translatable. Add documentation describing block transforms. Add documentation for nested template definitions. Add documentation for registering sidebar APIs. Move them to extensibility docs. Under the hood, there are many more updates implemented in this release, specially for developers. Please check out the actual changelog and follow github﻿ issues closely. Every single contribution matters. As the new editor is in the development phase, we all need to help somehow to make it a success. If you can spare a few minutes a week and test and report any issues/bugs to the team that would be very helpful. Even any idea/suggestion which remains in the focus area is worth passing to improve the editor. So go ahead, update and test the plugin, and report bugs/suggestions/ideas to the team via github .